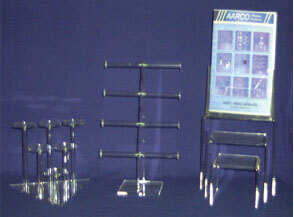 Welcome to AARCO Display Products where you can see the largest selection of stock Acrylic Displays on the internet. 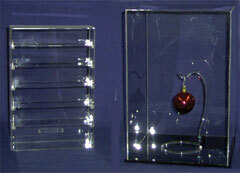 We Carry over 750 items in stock for immediate shipment. Use the navigation bar to the left to browse through our product line, click on an item to see a color picture, or to get product specifications. If you don't see what you are looking for in our stock items we invite you to see our custom page where you can get information on having your custom item made to your specifications whether you need 1 prototype or a 10,000 piece run. Use the Catalog Link to download a copy of the catalog or view it online, but we suggest you use the product navigation buttons to the left as we show approx. 200 items that are not listed in the catalog. You can also use the links above to get sales information, find out more about AARCO Display, or to contact our knowledgable and helpful sales staff.